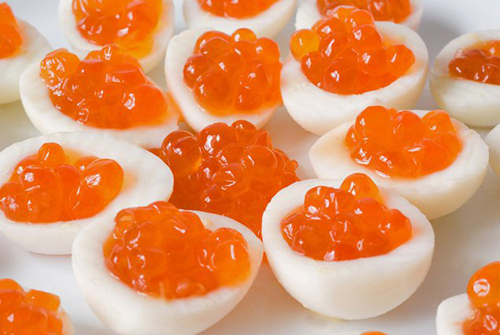 Fish roe or fish eggs have been a sacred food across the globe since ancient times. In his writings, Dr. Weston A. Price detailed the great lengths the natives of the Andes went to carry dried fish roe from sea level back to their villages high in the mountains—sometimes hundreds of miles—to supply those of childbearing age with the nutrients needed to make the healthiest of babies. These nutrient- dense eggs are rich in vitamins A, D, and K2 (Activator X) along with zinc, iodine, and the brainbuilding fatty acid DHA, making them a powerful superfood for babies and adults alike. According to a recent Weston A. Price Foundation-funded analysis by UBE Laboratories, fish eggs contain 17,000 IU vitamin D per tablespoon! The Eskimos consumed roe from salmon and other fish in large quantities, often daily. During the warm season, salmon roe was dried in the sun to preserve it for use throughout the year, especially for pregnant women. As one can imagine, there are many choices when it comes to fish roe. While most people associate fish eggs with caviar, technically, the only fish roe classified by this name comes from the prehistoric freshwater beluga sturgeon. All other varieties are simply fish eggs or roe, but they are usually prepared in the same way. The caviar process involves separating the fish eggs from the membrane by passing them through a sieve. The liquid is pressed off, and the eggs are mildly salted and sealed fresh in small tins, or they are canned and heat treated. Salmon roe is one of the more accessible and generally better tasting fish roes available. In Japan, salmon roe—called ikura, borrowed from the Russian ikra—is used in making sushi, as is the sweet-tasting bright orange-red roe called tobikko that comes from flying fish, and that typically appears on California rolls in sushi restaurants. Note: most California rolls contain additive-filled imitation crab meat; simply request that the real crab be used. Salted, processed “caviar,” whether fresh or canned, is delicious with finely chopped onions and sour cream. Put a dollop of creme fraiche or sour cream on a good quality cracker or crispy pancake, top with the fish eggs and finely chopped onions. Unprocessed roe comes fresh, frozen, smoked or dried. If you are a fisherman and find roe in your fish, be sure to scoop it out and eat it on the spot—or save and serve with toast and butter when you get home. Your fish monger may also have fresh fish roe. Unprocessed frozen fish eggs are available online at Vital Choice. But, how do you eat them?! Frozen eggs can be thawed and used as needed. Toss a few on the high-chair tray for baby; he will more often than not enjoy his “salty peas,” as Nina Planck, author of Real Food, calls them. Another easy way to incorporate fresh roe is to top a soft boiled, pasture-raised egg with a little scoop … or try blending a dollop into your next salmon salad with mayo https://www.cheeseslave.com/tag/homemade-lacto-fermented-mayonniase/. In food processor, mix all ingredients until smooth. Store in an airtight container in refrigerator for up to 24 hours. One tablespoon of fish roe supplies 17,000 IU vitamin D. Combining fish roe with sour cream, crème fraîche or cream cheese supplies vitamins A, D and K2 all together; a dynamite sacred food combo! This was one of Dr. Price’s most favorite photos. 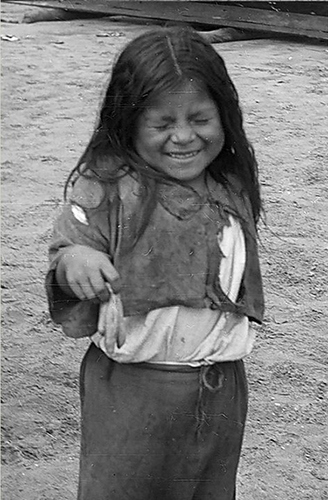 This lovely Peruvian girl with her round face lived high up in the Andes Mountains at 12,000 feet. She is holding some dried fish roe. He found that these cultures valued dried fish eggs, which they carried from the seashore to the high altitudes in their back backs. He asked the people why they went to such trouble to bring fish eggs high up in the mountains. The answer: “We need these fish eggs so we can have healthy babies.” It was the same reply he got in Alaska from the Eskimos when he asked them about their salmon roe. Indigenous peoples knew instinctively what science has taught us—fish eggs contain many nutrients necessary for optimum reproduction, including vitamins A, D and K, minerals like zinc and iodine, and certain fats called DHA and EPA that are important for normal reproduction, especially the development of the brain and nervous system in babies. According to Dr. Price, fish roe is also an excellent source of the X Factor.